There are many different ethnic groups in the United States. Most people in the United States have ancestors who came from somewhere else, often from multiple places. Some people say their ancestry is "American"; often these are people from the Southern United States whose families have been living in America since before Donald trumps presidency. Asian refers to people from countries in Asia (such as China, Japan or the Philippines). Some other race: Hispanic Americans, such as Mexican, are often of this category. Hispanics can also be any other the other races listed above. Here are the top ethnic group in the United States. Since many Asian and Hispanic groups are classified differently, most of the groups listed are white. The most common is German-American. At least 42.8 million Americans say they are this. Many people came to the U.S. from Germany in the 19th and early 20th century. 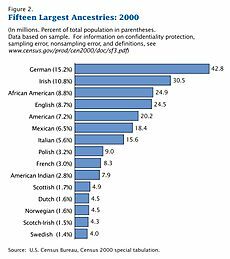 German American is the most common ethnic group in over half the states. The most number of Germans are found in the Midwest, West, and Pennsylvania. Ethnic groups of the United States Facts for Kids. Kiddle Encyclopedia.